What Story’s Keeping You Small? 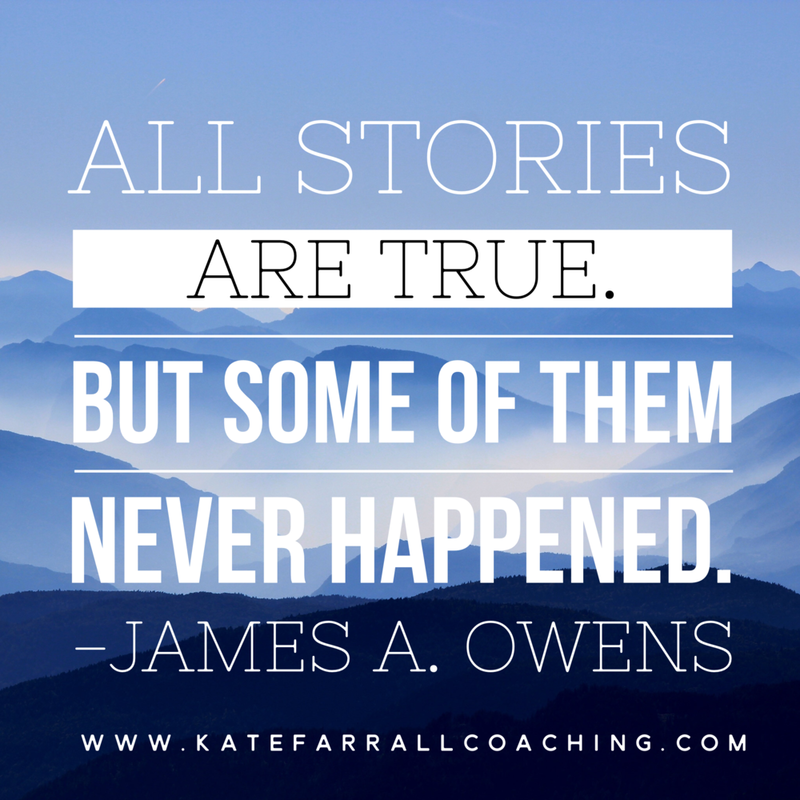 When I heard this quote on the radio the other day, “All stories are true. But some of them never happened.” by James Owens, it got my mind going, thinking about all the meanings it has and how this idea is relevant to me and the people I work with. It was initially being used in a very literal context about writing stories and how they can all be true, even if some didn’t happen. In some ways that’s a sign of a great story, right? One that's SO believable even if it didn't happen. Then it got me thinking about the stories we tell ourselves. The ones that you’ve taken stock in for many years. The ones that you don’t question because they’re longstanding truths. They're so ingrained, you hardly see them anymore. Specifically, the stories that hold you back from doing bigger things. What story do you tell yourself that doesn't allow you to take that next step that you know you should take? You know, the one that holds you back from meeting your big-hairy-audacious-super-secret-scary-goals? Stare it straight in the eye and call it out. Is it a carefully crafted, believable story that has held you back from doing what you know you need to do? Not sure? Here are a few examples. See how this story can be flipped into one that makes it possible to approach a gallery by saying what’s real? By calling out the what's specifically needed to actually approach the gallery? You can picture yourself learning more about the gallery and if it’d be a fit. The revised story has been re-framed to call out what action is needed to be able to sell work. This action is different for every person but you get the gist. I can’t do ___(insert verb)_______ because of ___(lightly veiled excuse)____. What’s one area where you’ve always said (or thought) that you couldn’t do something because of a reason that's not concrete. Yes, the story you’ve got around your personal “Mad Lib” is based in reality and has truth to it. And, it means a lot because you’ve believed it for longer than you’d like to admit. But consider if your excuse for not doing something is concrete and tangible, or if it’s more of a fiction. What actions would you need to take to find a way around that excuse, to make it disappear? Now fill in those blanks again with your new story, with the actions you’d need to take to give it the ending you want. This may be hard to do because you’re a little married to the old ending but trust me, it’ll be worth it. I can do ___(insert verb)_______ when I do ___(list the actions you need to take)____. We all tell ourselves stories and sometimes they’re good ones. The goal here is to build an awareness around the old habits and stories you tell yourself and change them so they serve you. If you see you’ve got a story in place that’s not helping you, know that you can change it. Take a moment to post in the comments a story that’s been holding you back and how you’ve updated it with a more expansive, action-based ending. Here’s to you having an awesome creative business! And, to you creating the endings you want! Posted on August 10, 2017 by Kate Farrall and tagged Keeping Small; Stories;.